By chef standards, Osteria has a pretty good one. 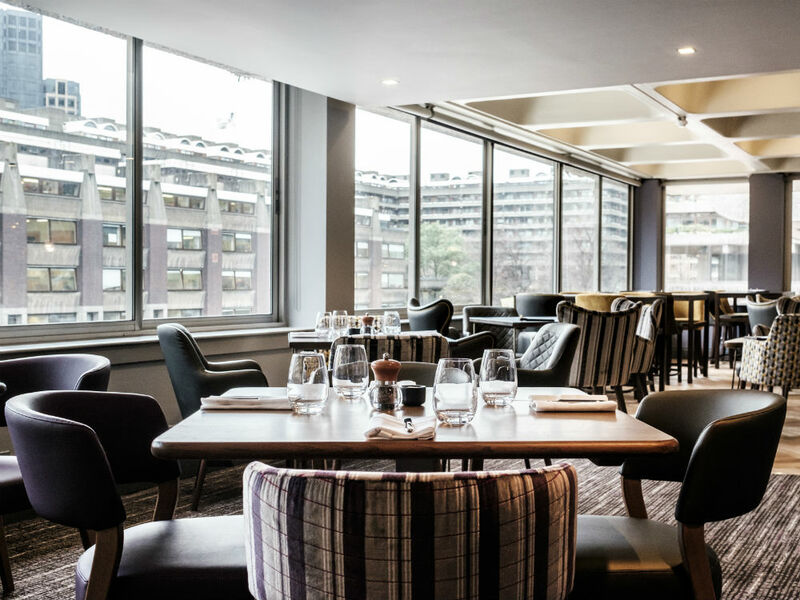 While you may not have heard of chef patrons Anthony Demetre’s newest baby just yet, if you’re a fan of food then you’ve certainly heard of the much loved Michelin-starred Arbutus in Soho or the beautiful Wild Honey in Mayfair. When I was first invited to Osteria, I have to say I was mostly intrigued by it’s location. The restaurant is inconspicuously (read: not well signposted) set within the Barbican centre, which I’d never visited before but always had the intention to. The Barbican, for those who don’t know it, is Europe’s largest multi-arts and conference venue with a full theatre and cinema schedule. While my boyfriend was more of the thought process that the building itself is a bit of a concrete monster, I was intrigued by the conservatory garden and the flats which sit inside it. After bumbling around in the building for a while trying and failing to find my way to the restaurant, I was directed to the second floor by a security guard who had clearly taken pity on my plight. The restaurant itself looks out onto the lakeside side of the building and though it may be decorated a bit like a swanky airport lounge, is comfortable, chic and discreet. Osteria’s menu focuses on Italian bistro food with a fine dining edge, with all of the pastas are made in-house and the wine list is sourced from the country. Having gawped at the menu for long enough, I ordered the grilled octopus, potatoes and smoked pepper while my boyfriend, Harry went for the young cow’s milk burrata, artichokes, carrot and toasted hazlenuts. While I enjoyed the octopus as it was soft – not chewy like it can become – and bathed in a slightly tangy oil, after tasting the burrata, I was convinced that I’d made the wrong choice. Soft, creamy and devilishly moreish this is the kind of dish that all meals should start with. For mains I took the advice of our lovely waitress and opted for the rabbit while Harry went for the veal and n’duja tagliatelle. While he was a little disappointed with the size of the dish and the minced appearance of the meat, it was tasty and fresh. My rabbit however, was the main event. Rolled with ham surrounding it and accompanied by farro, it was rich, tasty and comes highly recommended by all of the staff for good reason. When I return (rather than if), I’ll be hoping this will still be on the ever-changing menu. The Pear and Almond tart from the dessert menu was tasty, soft and accompanied by a large splodge of chocolate which is never a bad thing in my books while the honey and olive oil gelato was the great way to end a meal even if the honeycomb did stick in my teeth. While we didn’t indulge in the cheese board – which is cut infront of you on the huge cheese table which sits in the midst of diners, I was more than tempted and I can only guess that the cheeses on offer would be top notch. All in all, we had a fantastic time at Osteria. The service was sleek and quick – perfect for a quick meal pre-theatre – and the food memorable and tasty. Anthony, you’ll be seeing me again.